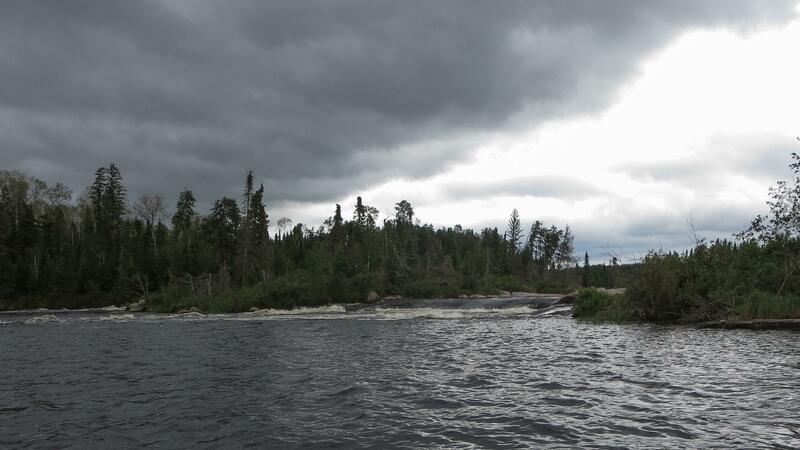 FIRST POST: Canoeing The Bloodvein River System: Introduction, Planning, and Map Resources. 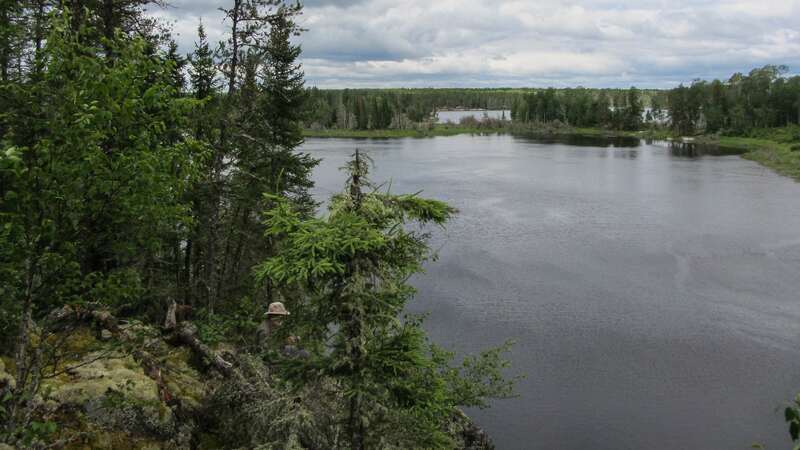 Artery Lake – the ultimate pictograph lake – sits on the Ontario side of the border in Woodland Caribou Provincial Park with just a bit of it in Atikaki Park on the Manitoba side. 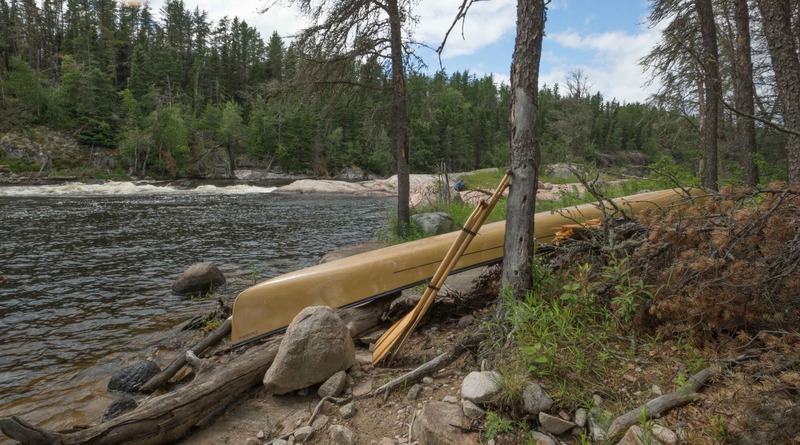 For canoe trippers doing the entire length of the Bloodvein, it represents both an end and a beginning. 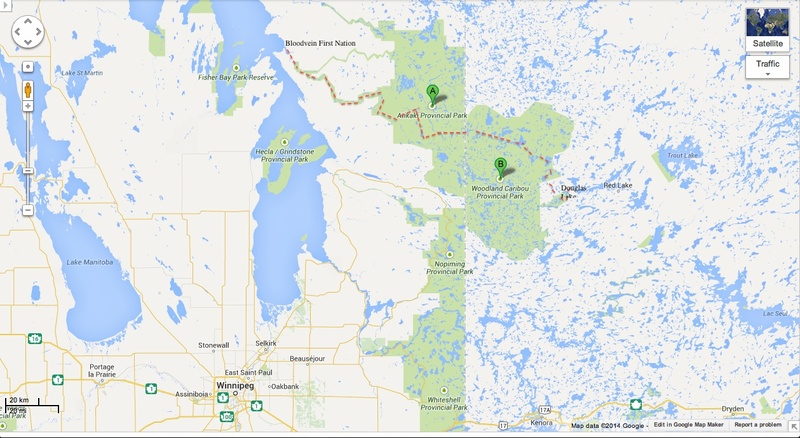 our route from Douglas Lake off Red Lake to Bloodvein First Nations village on Lake Winnipeg – Artery Lake sits right on the Manitoba-Ontario border. Click on the image to enlarge! It is the end of the headwaters section of the Bloodvein River. 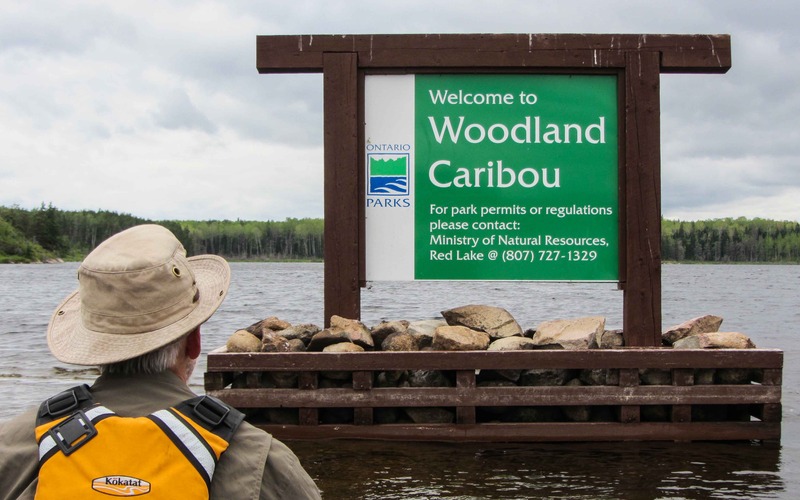 We had spent almost a week paddling across Woodland Caribou Provincial Park from Douglas Lake. The six kilometers or so of portaging in the first three days and a wind that was often blowing east meant we had paid some dues to get to Artery. 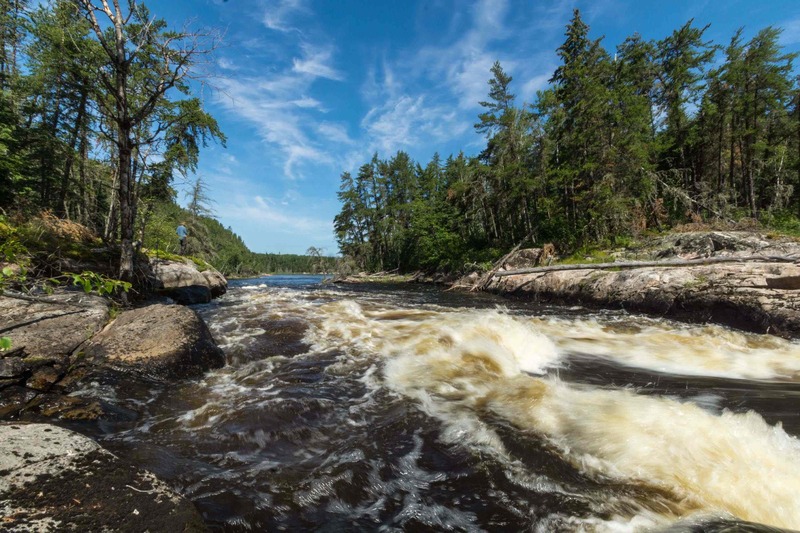 The hours spent on some very scenic flat water stretches had been our reward and paddling by two major pictograph sites of the entire Canadian Shield was an appreciated bonus. But now we were in for a different trip. Artery Lake is also where the Bloodvein as a river, as opposed to a series of lakes joined by the occasional narrow channel, begins. 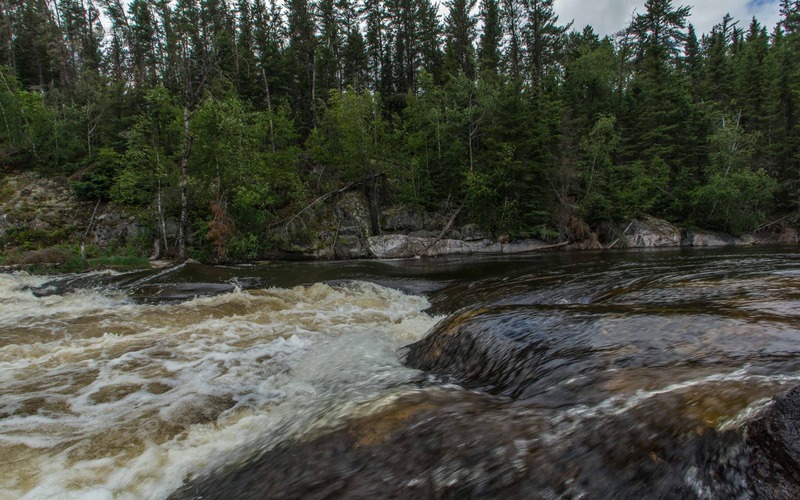 From Artery Lake to Bloodvein Village there are 80 sets of rapids to deal with. 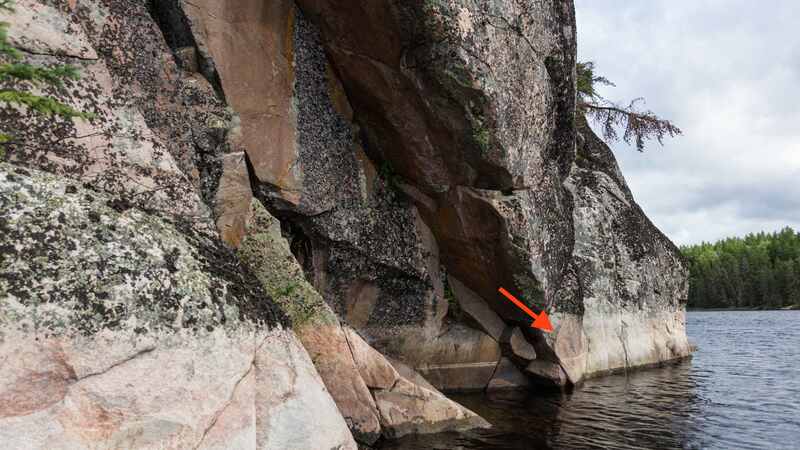 Sloping or vertical granite rock face lines the shoreline – sometimes on one side and occasionally on both – and creates that closed-in feeling that makes river paddling special. 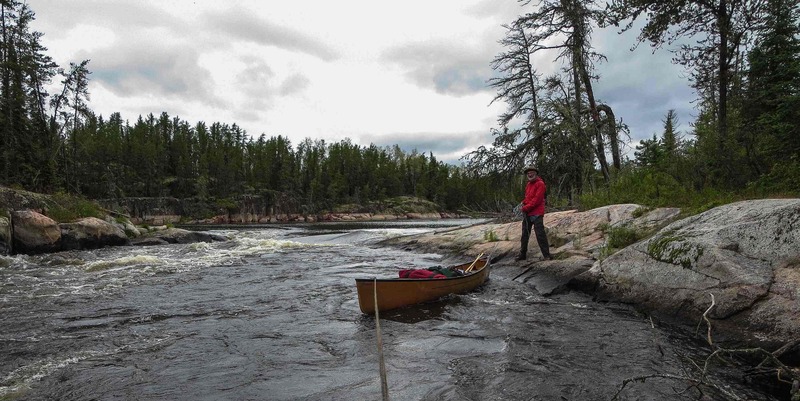 As for portages, we would do half as much during the ten days from Artery Lake to Lake Winnipeg as the six kilometres we did in the first two and a half days of the trip through the headwaters. We were looking forward to the change! campsite: above W14. 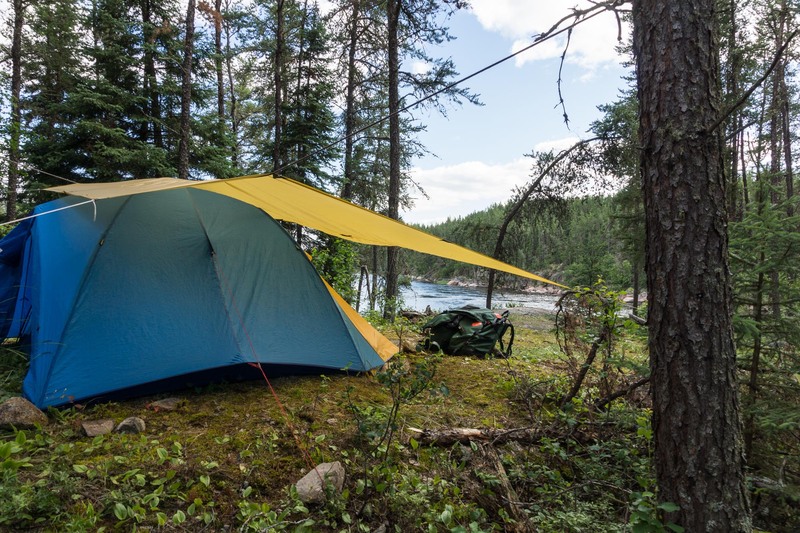 We called it the Fineview; it was our best campsite so far. 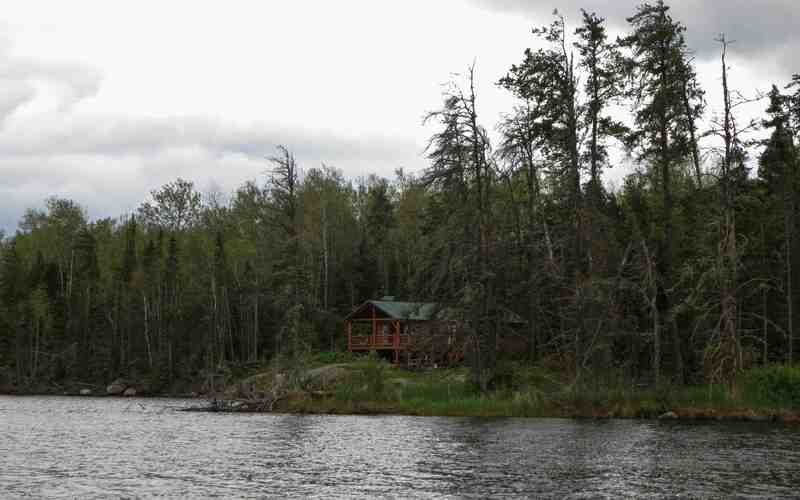 In the original plan Day 7 had been set aside as a spare/rest day on Artery Lake. We decided that instead of sitting around for the day on Artery we would put in a leisurely day on the water and see how far we got. 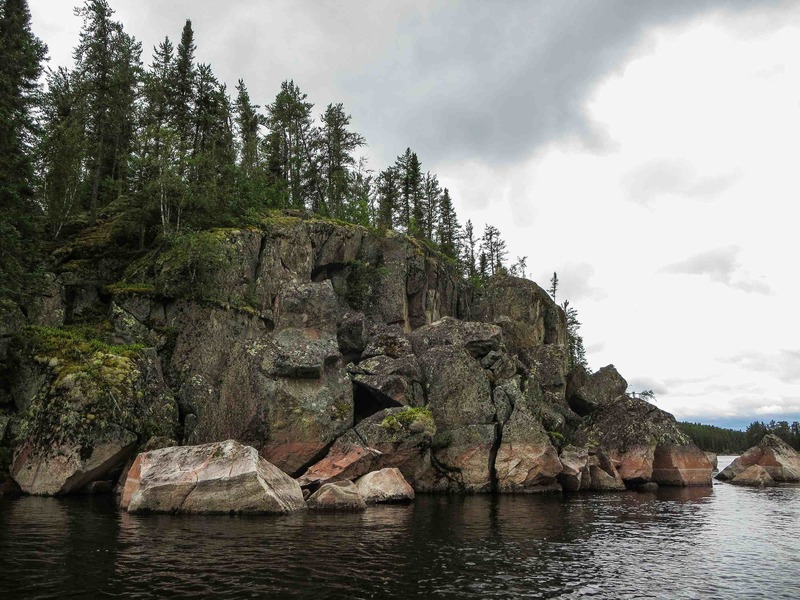 As we looked up the lake shoreline we were not seeing much of that essential ingredient of any pictograph site – a bit of a rock face! A bit closer and it looked like we had found what we were looking for. 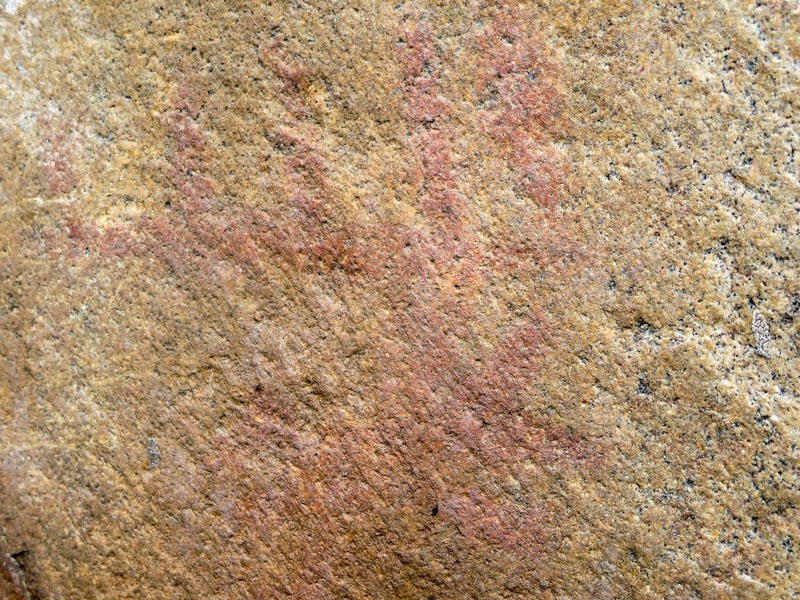 To the right of what almost seemed like an entrance into the rock face for the maymaygwayshi who were believed to live there, were a few ochre markings. The images were barely discernible – see below for what looks like a crudely drawn Thunderbird (?) and a arch with lines or figures standing on it. There were a couple of other vague marks but that was it. 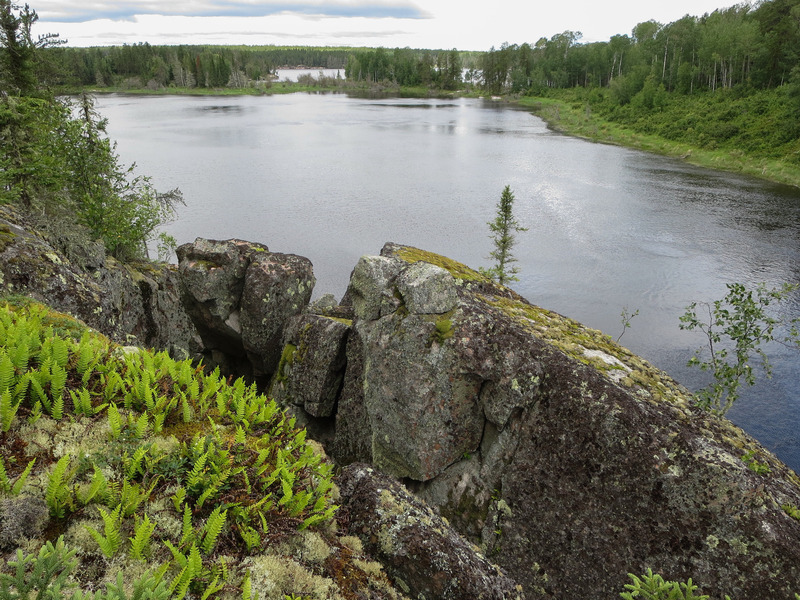 This humble site was more in line with the site on Red Lake and the one at the east end of Murdock Lake that we had seen earlier in the trip. We didn’t know it at the time but the site at the east end of Artery Lake that we had visited the day before – see here for some pix and discussion – would be the #1 site of the trip. 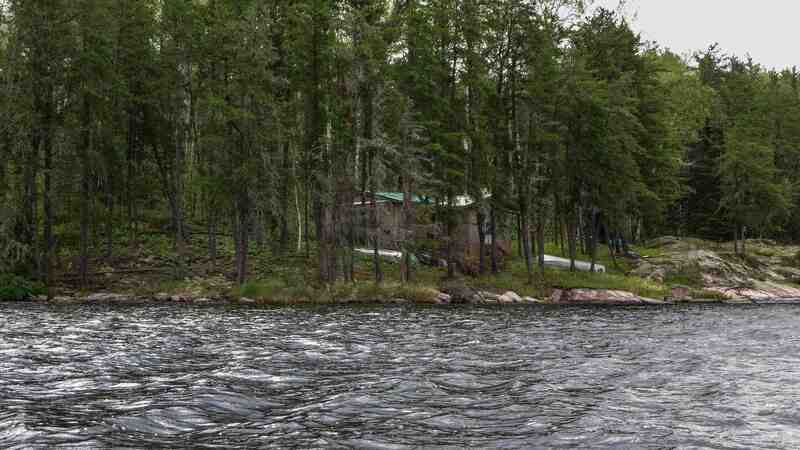 This makes it that much more of a “must see” for those canoe trippers flying in to Artery Lake for the beginning of their down-the-Bloodvein adventure. 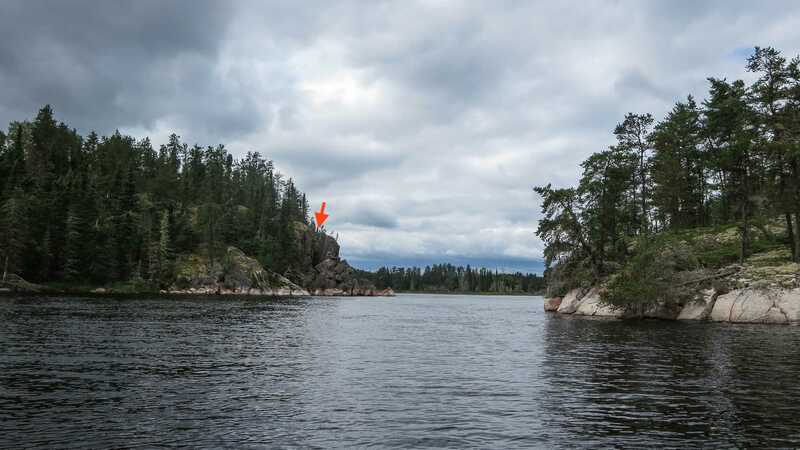 Wanting to make sure we hadn’t missed something, we paddled another half-kilometer up the arm, checking out a couple of other rock faces but we came up empty. 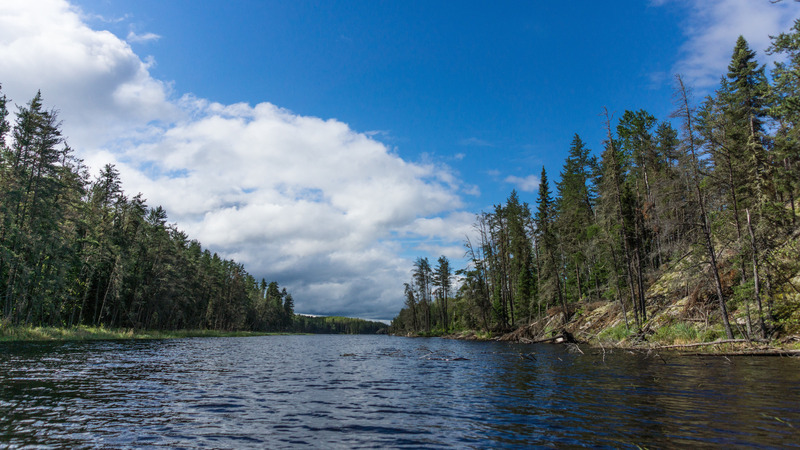 Then it was time to paddle back down the shore across from where we had camped the previous night and on to the Ontario/Manitoba border as it crosses Artery Lake. 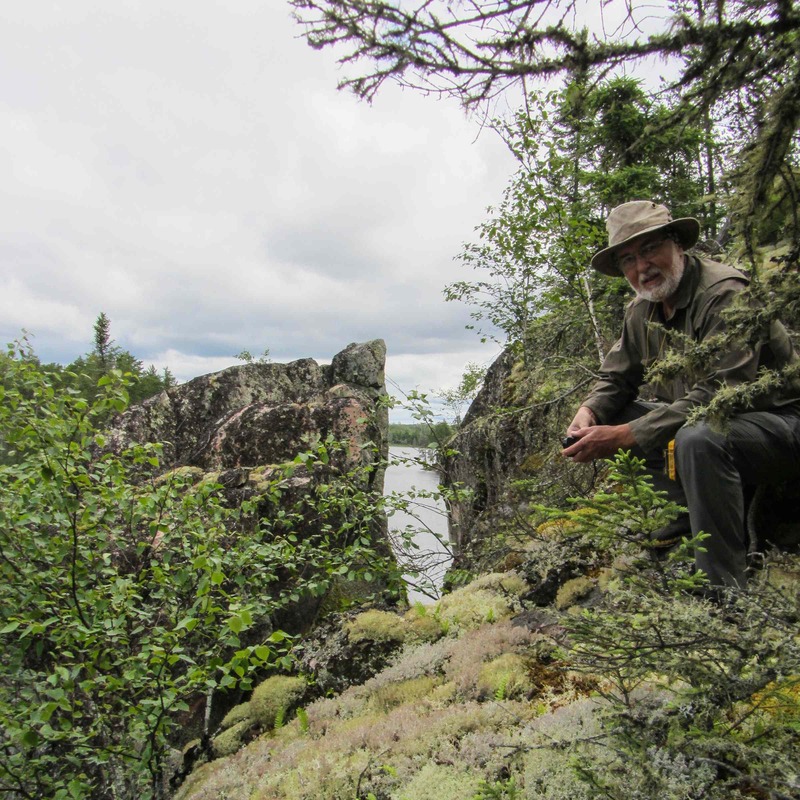 As we rounded the corner and headed west we noted the vertical granite on our right and remarked that this would make a much more obvious – and dramatic – place for someone to place a pictograph than the dead-end north arm of the lake we had just checked out. 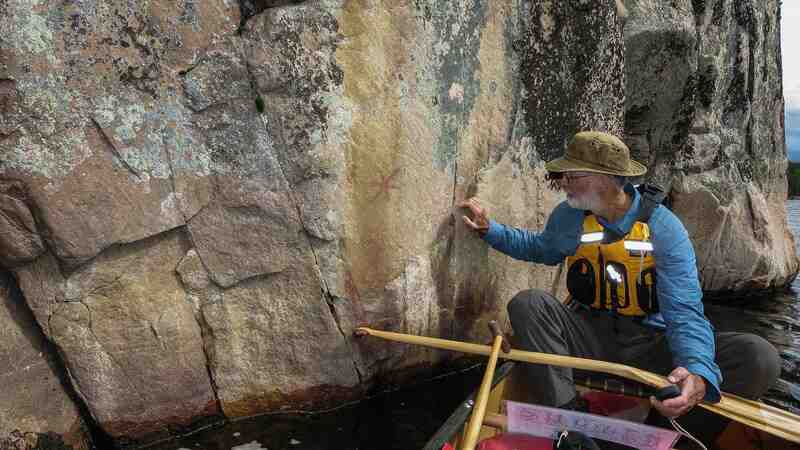 Sure enough – we paddled by the rock paintings you see above. Perhaps the small stick figure represents a maymaygwayshi? 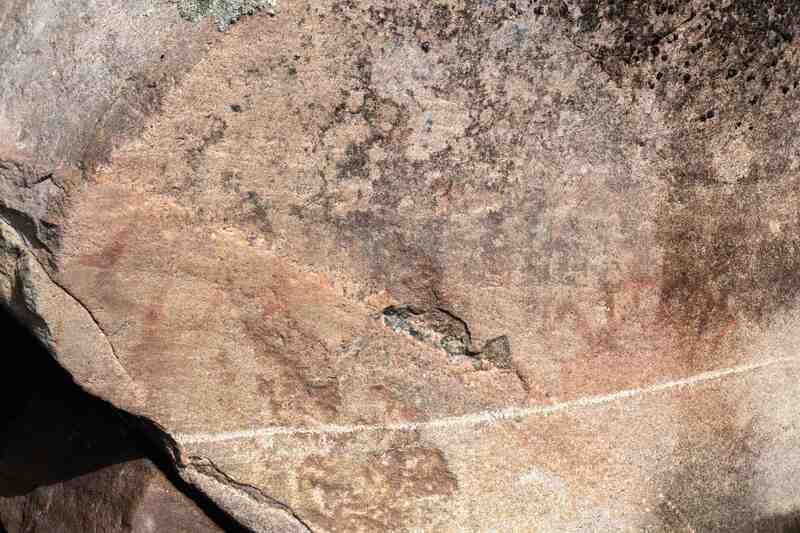 The very common canoe image is faded but visible, even if half the canoe seems missing! Three hundred meters further on we came to our first portage of the day – W10. We had been curious about exactly what the fifty-meter marine rail involved and now we got to make use of it. 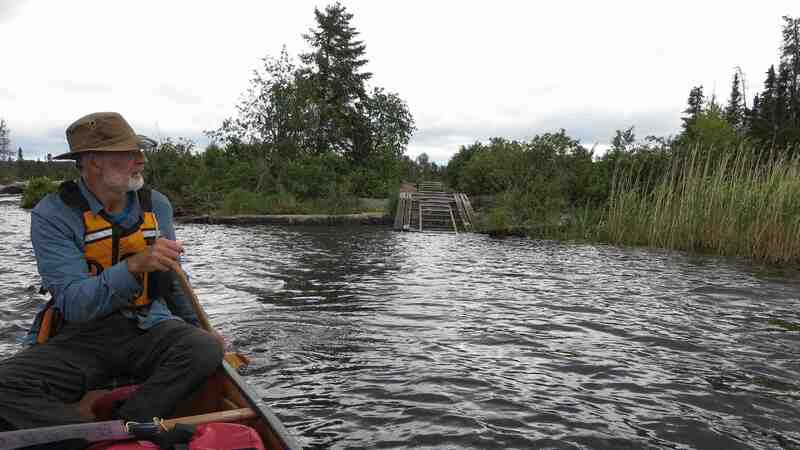 In a little more than a minute we had dragged our canoe over and were on the west side of the island. In the lake on the other side of the rapids were a couple of fishing boats. We waved as we paddled by but they were some distance away. 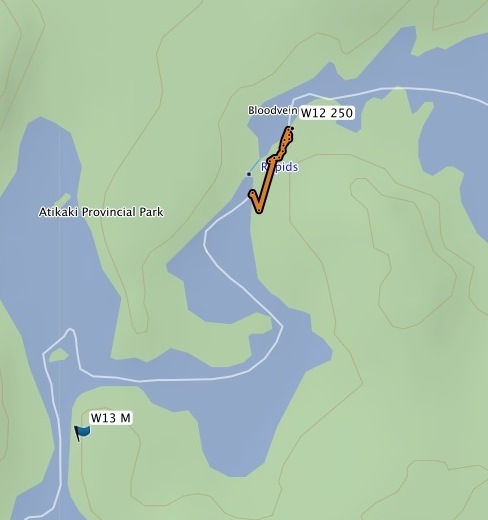 They were probably staying at the Jackson’s outpost about 2.5 kilometres further down the lake which we paddled by a half-hour later. 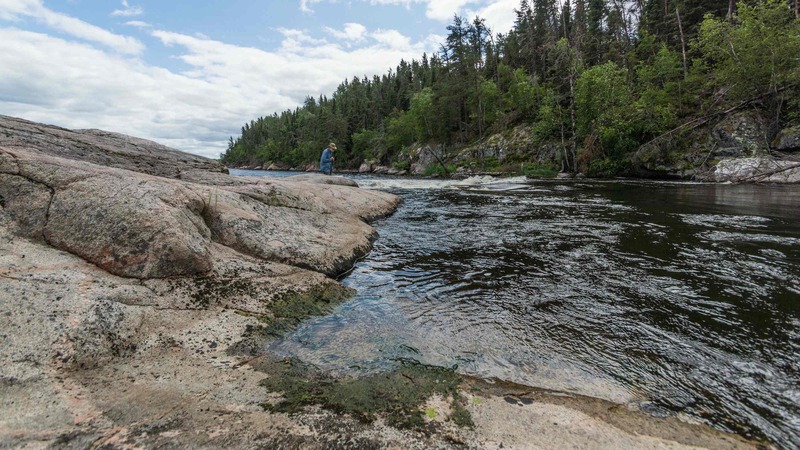 Having always thought that a lake is defined by, among other things, a single water level for all parts of it, I am left scratching my head about why the water below the rapids is still considered Artery Lake. 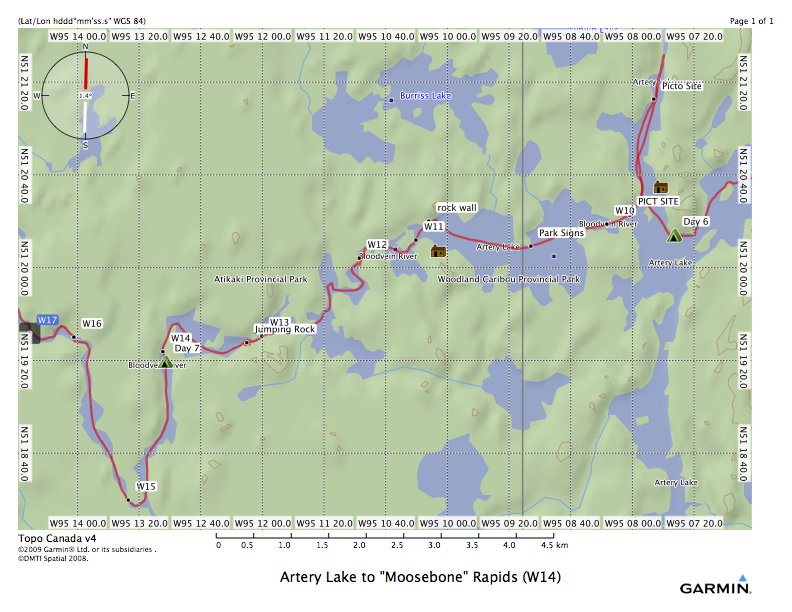 The Topo Canada 4.0 map installed on my Garmin Oregon compounded my confusion by labelling as Artery Lake the water above the rapids (W08 and W09) which lead into Artery Lake. (The Wilson map calls the water above W08 Mary’s Lake, although the name does not appear on any of the Federal Government-generated topos.) The Garmin map also gives the same elevation of 329 meters for the water above W08 and W09 as it does for the water below W10. Either something is not right or this is a classic example of me having way too much time to think about stuff while working the water with my bent-shaft paddle! 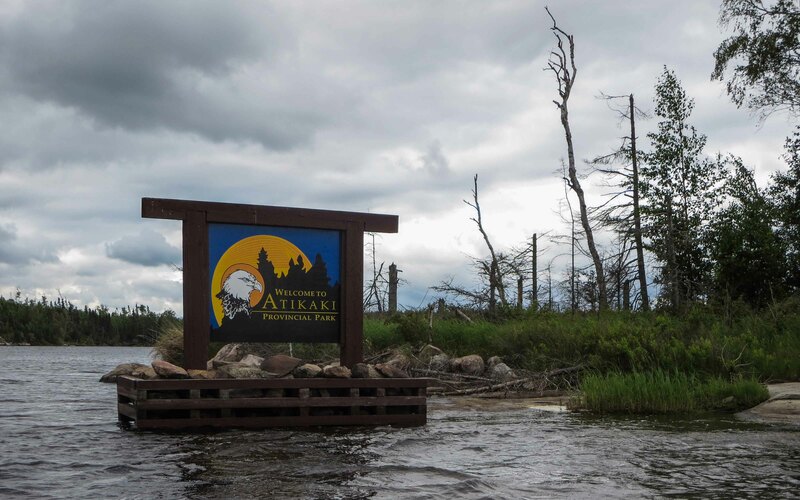 We relied on the Wilson/Aykroyd maps for all of our rapids/portage info. As I have noted elsewhere we’ve numbered the rapids the way they appear in the Wilson book (that is where the W comes from). 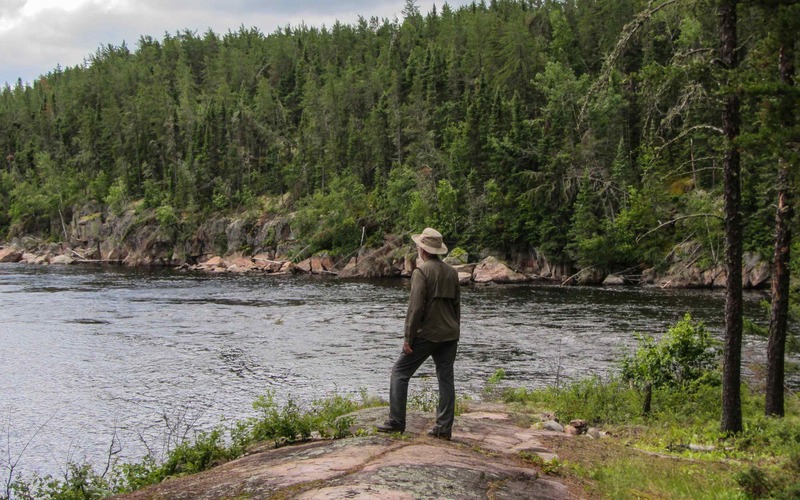 Also appreciated on the entire Manitoba stretch of the river was the orange prospector tape which indicated 95% of the upcoming take-out points. While the Wilson book provides the info and it was usually pretty obvious, it was still reassuring to know that we were on the right track. Unlike the purist who huffs and puffs as he takes down all the orange tape he sees, we are not offended by these “heads up” indicators! Near the end of this day’s paddle we approached “The Jumping Rocks” on river left. 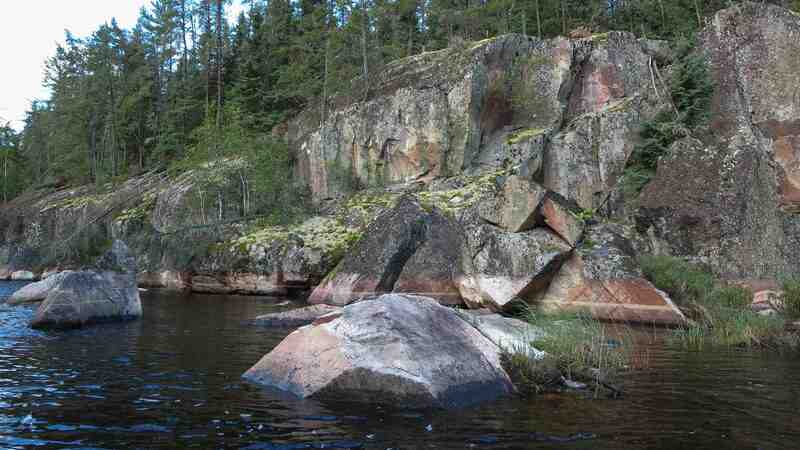 It is a 15-meter high rock face with a vertical split separated by about 3 meters of empty space. According to Wilson’s trip notes, there are Ojibwe stories of people jumping the gap. Maybe a test of manhood in the tradition of bungee jumping in Polynesia? More likely just a tall tale told to a gullible listener for whatever reason. Not long after our brief pause to take in “the Jumping Rock” we were back on the river for the last stretch of paddling. Fifteen minutes later we pulled up to the take out spot above the set of rapids you see in the pic below. Our first day in Atikaki was done and it had turned out to be a nice day after a not-too-promising rainy start. 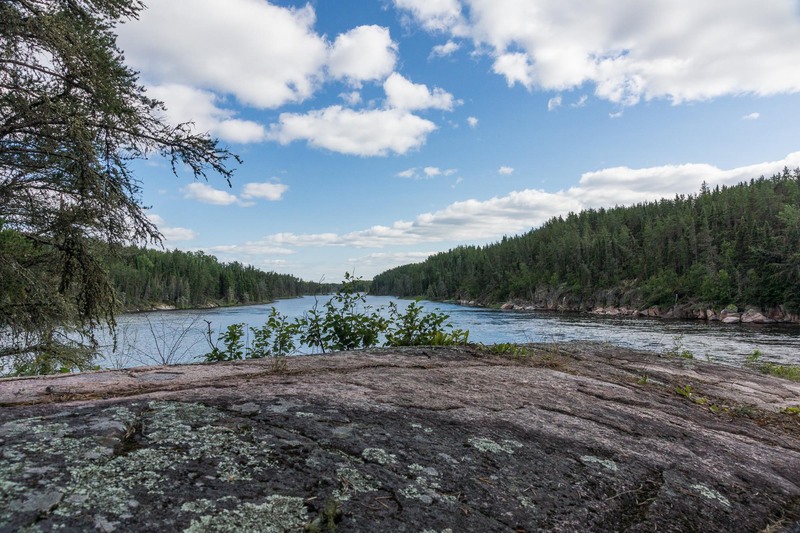 The excellent campsite (we called it the Fineview for the vista it provides) sits on the flat top of a hill and is a 40-meter walk along a trail above the rapids named “Moosebone” by Wilson/Aykroyd. Since we had stopped in the early afternoon we had lots of time to scamper about and point our cameras in different directions. A few of the shots can be seen below. This Bloodvein series is fantastic. I’m heading down the Bloodvein in a couple weeks, and it has been a big help for planning. 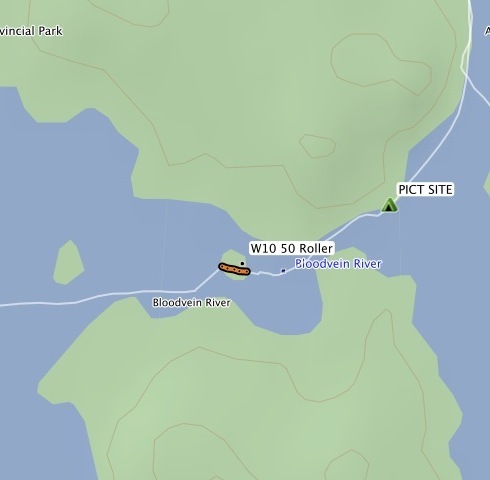 Is there any chance you’d be willing to share your GPS coordinates for the Wilson numbered rapids? It would be a good back up. Thanks either way, and again I very much enjoyed all these posts.